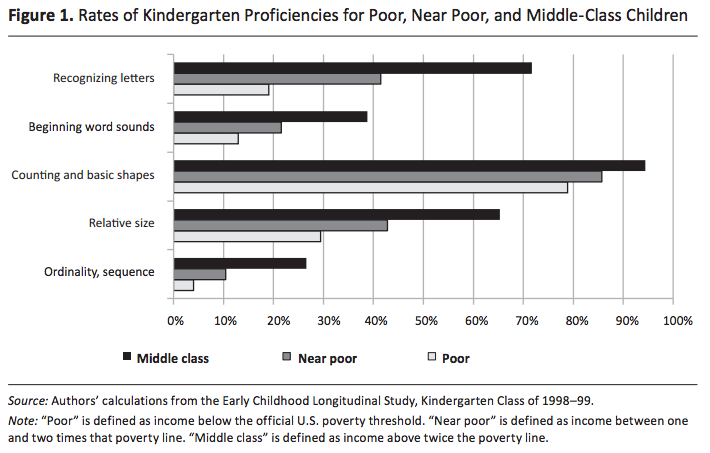 Low income and poor kids start kindergarten systematically behind their peer. Less than 20% of poor kids can be considered proficient recognizing letters, compared to more than 70% for middle class families. This is a huge disparity than exist before most children enter the public education system - and it persists, or even widens, over time. Focus on early childhood poverty: If it turns out that poverty is most devastating in early childhood, then increasing the cash flow to families with very young children is a good investment. In a recent policy brief, for example, we proposed making the Earned Income Tax Credit more generous for children under the age of 5. Tie cash to behaviors: One way to deliver cash assistance is by using cash payments to reward positive behaviors such as children’s school attendance or preventative health care. New York City’s Family Rewards program, for example, ties cash rewards to several indicators of children’s education, preventative health care, and parental employment. Don’t cut family income: If higher income expands opportunity, then the reverse is also true. The authors warn that “reductions in the generosity of programs such as the EITC can be expected to reduce children’s success. That is - addressing poverty is important, but we also need to invest in pre-K education. The legislature just took some bold steps in this direction this year - and we should keep moving towards universal access to pre-K.